The Cotswold Wildlife Park near Burford in Oxfordshire is one of the best days out in the area, while the profile of the Cotswold Farm Park has been raised by Adam Henson's appearances on various television programmes such as Countryfile. 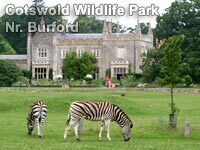 The Cotswold Wildlife Park, near to Burford in Oxfordshire, is set in 160 acres of parkland and gardens around a listed Victorian Manor House and has been open to the public since 1970. The Cotswold Wildlife Park is home to a fascinating and varied collection of mammals, birds, reptiles and invertebrates from all over the world and aspires to show animals to people - so that they can come to understand and respect all forms of wildlife; to understand what is special about each species, and how the various species have evolved over very long periods of time, adjusting to survive in habitats from many parts of the earth. Many special events take place through the year such as falconry displays and classic car gatherings. At the end of August 2006 Wolves were introduced to the Park and visitors can walk along a meandering wooden walkway to a sheltered viewing platform to observe these facinating creatures. The Park and gardens are always immaculately kept and this really is a 'must see' attraction for visitors to the Cotswolds. There are various refreshment kiosks in the ground of the Cotswold Wildlife Park where you can purchase drinks and snacks and the cafe sells a selection of hot food and sandwiches. On a fine day you can picnic on the large grassed area near the restaurant while you keep and eye on your children playing on the adjacent play area.